Does Your Son Need a Male Role Model? I have raised two sons as a Solo Mom. They are both young adults now and have a good sense of how to be kind, respectful, capable, and responsible men in the world. I wasn’t sure that would happen, as their father was not able to demonstrate those qualities to them. They had me, but I didn’t think that was enough. Although I know in my head that many successful and sensitive men have been raised by Solo Moms, my heart would feel that my sons needed to have a connection to a healthy, balanced man. My older son lashed out at me after his father was barred from seeing him. He tried to bully me with demands for things he wanted. He had seen his father do it, so he thought that was how it should be. I stopped the bullying immediately, but I could see he was flailing in the sea of his own masculinity. I asked my son to go see Michael, a man I knew who was a life coach of sorts. He wasn’t a trained therapist, but he worked with teens and had gone through a tough adolescence himself. Michael was a man who could climb Half Dome and then cry with a friend who had lost a loved one. He didn’t have all the answers, but he knew how to show up authentically. My son loved him. He became the first of several healthy, sensitive, mature men who came into my son’s life and showed him how to be a real man. Michael also introduced my son to other men. Some helped with physical healing. Others helped with emotional healing. Over several years, they became friends, too. My second son, a quiet introvert, didn’t act out, but he was also swimming in a big ocean of feelings he did not understand. Though he was kind and respectful to me and others, he needed a map to traverse the path from being my son to being his own man. I could give him love and safety and understanding, but I could not give him that from a male perspective. With him, I looked for areas of interest where he could develop competency and confidence. If the leader was also a man, that was a bonus, but I focused on my son’s interests first. I also “forced” him to take a free half-hour guitar lesson at a rock-music studio. The teacher was a man with wild hair and a Rolling Stones T-shirt. My son silently followed him into the back room. Thirty minutes later, I saw my son’s face glowing with pure joy, and I knew he found his place. The music instructors were mostly men, and he learned to be guided into his talents. He worked hard to learn the music, showed up to help lug gear, and soon became the quiet assistant director. It turned out he had a knack with the young kids and soon became a favorite at the studio. Both my sons have a fragile relationship with their father. He represents something they don’t want to be, but he is also their father. He is family, even if it is hard to be in a healthy relationship with him. There are other men in both our families who have reached out to my sons over the years. One uncle is easy to be with, and they enjoy his company. They only see one another a few hours a year, but somehow that is enough. Uncles, grandfathers, and other men in the family have a unique position for boys becoming men. They hold the lineage of the family; they knew the aunts and mothers and cousins when they were young. They can remember when our boys were babies and share old pictures and stories. They have the gift of being part of the family, even if they aren’t part of our sons’ daily lives. 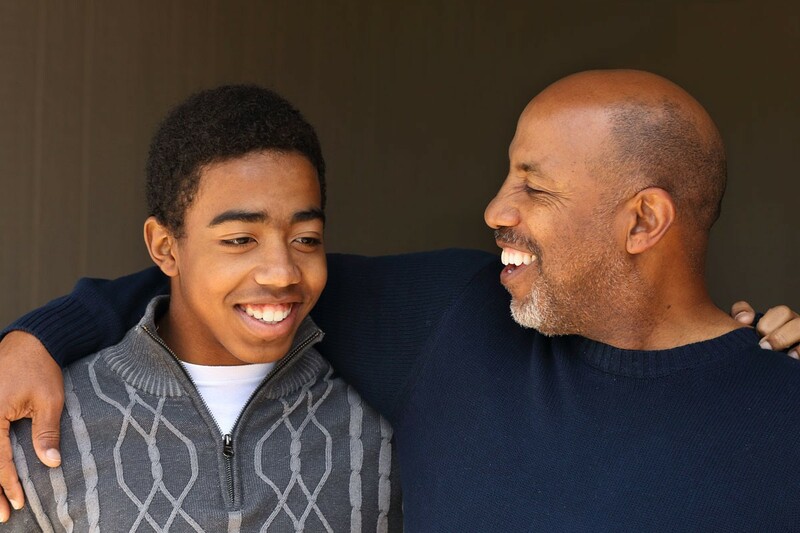 The men in our families can be role models, and they can also be yardsticks. They provide a measuring stick for our families—sometimes we want our sons to grow past the mark or, other times, to grow up to the mark. Male role models in the family, in particular, can hold up a mirror to our sons. Sometimes choosing how not to be is as powerful as choosing how to be. I learned from the many kinds of male role models that weaved their way into my sons’ lives that my role was to watch and listen. Sometimes I dragged my sons to men they didn’t like. Sometimes a man just appeared, like the music director at the rock studio, and fundamentally changed my lost boy’s life. Good men are all around. Follow your son’s interests and his needs as a starting point to introduce both parties and then get out of the way so that it’s their relationship. I might not always agree with how things went between my sons and the men in their lives, but I wouldn’t change a thing. My sons are men I am honored to have in my life, and I am forever grateful for the men who showed them the way. Do you have questions for other Solo Moms who have boys? Sister Chat is a great place to ask awkward questions in a confidential setting.